Former Aladdin Resort & Casino had purchased from Badia Design Inc. before it open on August 18, 2000. The resort contains 1,001 Arabian Nights – an exotic main casino themed after the tales of 1,001 Arabian Nights. It offers 100,000 square feet of gaming amidst flying carpets, ebony horses and an ever-blooming “Enchanted Garden” of lights. A unique stacked layout places the hotel lobby, casino and restaurants on separate, easily accessible levels. Aladdin’s innovative design eliminates long walks in public areas. The casino contains 2,800 slot machines, 87 table games, Keno, and Race & Sports Book. The casino also contains the world’s largest indoor light board which creates a 130 foot “Enchanted Garden” with a constantly changing display of vibrant blooming flowers, as well as a 36 foot magic lamp towering above the casino floor. The talon and nest of a giant Roc Bird, taken from the tales of Sinbad and the Sailor Giant winged horses from the Tale of the Ebony Horse mark the entrance to the Aladdin Race & Sports Book. Contained in the main casino area is the 35,000 square foot The London Club. This area features an elegant 15,000 square foot main casino offering 30 high-limit table games, including baccarat, roulette and blackjack, 100 high-denomination slot machines, exclusive higher limit gaming facilities, a private lobby and dedicated elevator service, a 120 seat five star restaurant offering a multi-ethnic menu and al fresco dining on the Strip, and a multi-functional lounge and garden club, and private reception room. Smaller gaming rooms are designed to recall the exclusive “salle privees” found in Europe’s most celebrated casinos. There are more than 135 stores in the Aladdin’s Desert Passage, which is the 500,000 square foot shopping adventure that surrounds the resort. 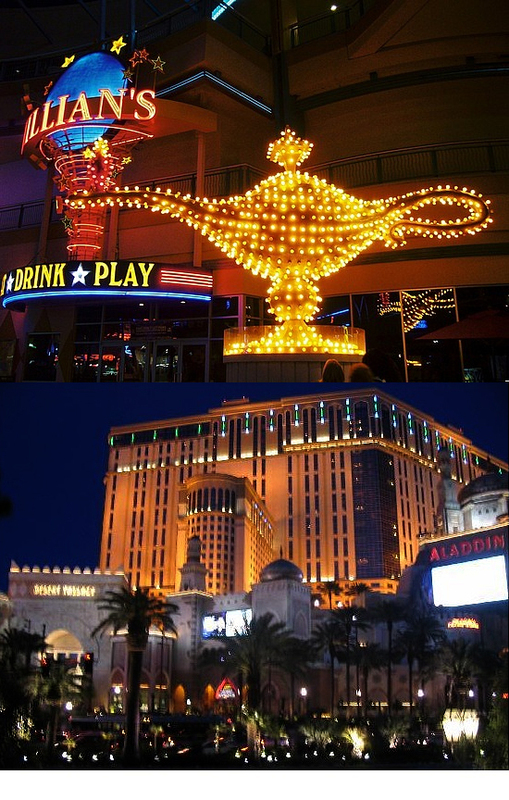 This entry was posted in Moroccan Home Furniture and tagged aladdin, Aladdin Desert's Passage, Aladdin Resort & Casino, Arabian nights, casino, Las Vegas Casino, Las Vegas Resort, Planet Hollywood, resort. Bookmark the permalink.